The Jaguar E-PACE is the very first compact SUV by Jaguar. Its sporty looks, agile performance and innovative features make it a stylish and versatile vehicle. This midsize SUV is capable of seating 5 adults comfortably thanks to the intelligent use of space. This vehicle can accelerate for 0 to 100 km/h in just 7 seconds. 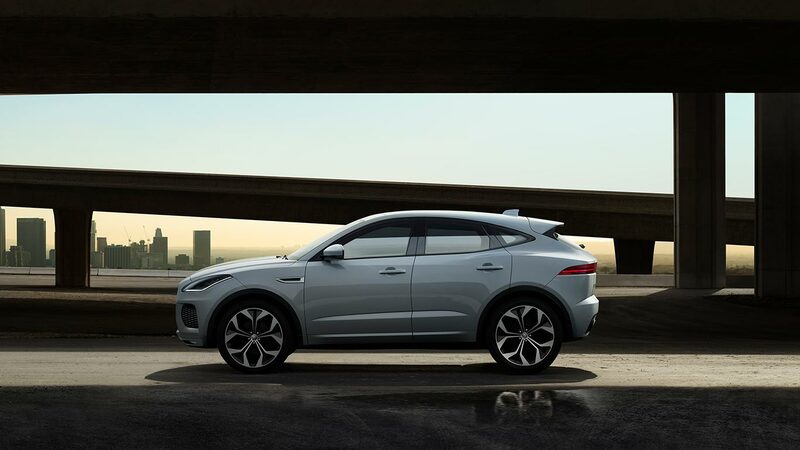 Furthermore, The 2L 4-cylinder engine that comes with the base model is capable of producing a power of up to 246 horsepower and a torque of 269 lb-ft.
With the Jaguar E-PACE, there is no excuse not to enjoy the beautiful scenery around you. This vehicle has an optional fixed panoramic glass roof that helps bring more light to your vehicle. You can also choose from a range of wheel options that enhance the sporty look of your SUV. Inside, enjoy the heads-up display that provides you all the necessary information for your trip and also allow you to stay focused on the road ahead. The new Jaguar E-PACE will take you and your family safely to your destination, thanks to the many safety features that have been designed into this vehicle. If a potential collision is detected, the emergency braking system gives you an audible warning and if the driver does not respond, the system will automatically apply the brakes. The lane keep assist system help you stay in your lane in case you unintentionally drift out. Other safety features in the Jaguar E-PACE include a 360-degree surround camera and a blind spot assist system. There are a total of seven different trim lines available with the Jaguar E-PACE: the E-PACE, the E-PACE S, the E-PACE SE, the E-PACE R-Dynamics S, the E-PACE R-Dynamics SE, the E-PACE R-Dynamics HSE, the E-PACE First Edition. These models all have different features and options for you to choose from. The E-PACE First Edition remains the most unique, with its Caldera red paint and its 20-inch split-spoke alloy wheels that make you stand out from the crowd.